You have an unbelievable collection of photos with some real greats. Thanks for sharing. Enjoyed looking at the Mick Karn and Kraftwerk ones. Some truely unique pictures there, i especially like the ones with John and Midge. I loved the Midge ones (there's a surprise! )....thanks for sharing them. Can't believe I missed these. What a great set of pictures. Some real heroes in there! Keep on getting in there! Especially nice to see Martin from ABC! I always like the off stage pics from Mr Normal. Mr Normall, will you be putting in an appearance at Ye Olde Citrus Club on April 10th? FANTASTIC FOTOS Mr. Normall!!!! I have already downloaded them to my hard disk and will not hesitate showing everyone who walks into the office throughout the day!! So nice to meet and chat with you! Excellent outfit, we loved it!!! Hope you got home fine. Our paths shall cross again one day, I am sure. And you got some fantastic photos; flicking through them brings back some wonderful memories! Nice photos, keep up the good work Mr Normall. Fantastic shots my Finnish friend. It was a pleasure to meet you & have a picture taken with you. Ex-Ultravox guitarist and John Foxx collaborator Robin Simon were a member of our after after party posse . The Roundhouse gig was a week ago and Hammersmith gig two weeks ago, but I still can't think much else than those wonderfull nights. 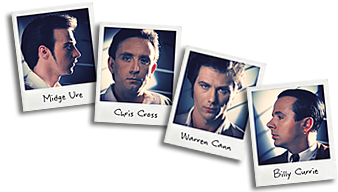 I was lucky enough to meet all the members of Ultravox and met many fellow Ultravox-fans. I wish Ultravox will do a gig (or several) in London in the future again. Bravo Tapio!!! Well done! So you were well accompanied, too, this time, I heard! Hahaha, can't forget your words "Mr. Normall with 2 'l' - so not so normal". I also took a quick look at your John Foxx photos - wow, he really looks good, huh?!? I have "re-werked" the Kraftwerk-page on my Close Encounters Of The Third Kind gallery after last weeks Krafwerk gig in Helsinki. It has now pictures of their each gig in Helsinki: 1991, 2004 and 2009. 1991: The Kraftwerk lineup was already the same as through '90s and '00s until Florian Schneider left quite recently. Stage set-up is very different from what it is now and you could see them actually play their elektrik instruments, even percussion. As far as I can remember 1991 photos are mostly taken by a very tall guy called Arto Marjoniemi who was with us to see the mighty Kraftwerk play live. 2004: We sat so far away from stage that there were no point to take "on stage" pictures. I took "close encounters" pics instead. Ralf Hutter signed four CD-covers and an after party flyer but said "no pictures". We were nice/stupid enough and didn't take any pics of him. It was lucky that I met Florian Schneider before he left Kraftwerk. 2009: This was last thursday. I think here is some very nice pictures. My favourites are Schaufensterpuppen pics and especially the last one where Ralf Hutter is alone on stage and plays last notes of 'Musique Non-Stop'. For me as a Kraftwerk-fan since 1981 that last picture is enough to make me a bit sentimental. Excellent stuff, Mr N. Looks odd seeing them on stage without Florian though. Mr Normall - as i've told you before - love your site - you certainly have some amazing adventures! Ex-Bauhaus vocalist Peter Murphy live in Milan 5.10.2009. My pictures here . Yer a class act, Mr N.
I was to London few days two weeks ago. Originally I was going to see live two of my most "left field" favorities Sheep On Drugs (which I liked in early '90) and Martin Degville's Sigue Sigue Sputnik. Sheep On Drugs gig was cancelled but there was "invitation only" Marc Almond gig for the same night. I had a very good luck and got a free access to the gig (Thanks to Michelle and Wesley D). The gig was at the 100 Club which is a small place and there was maybe 150 people in. The crowd was surprisingly enthusiastic given that they were not the fans who had bought their ticket to see their favourite artist. Marc Almond looked very good and seemed to have fun on stage. He even walked off the stage into the middle of the audience on one point. Neal X (Sigue Sigue Sputnik) played guitar. Sigue Sigue Sputnik was my #1 favourite band for years. It all started when I saw Love Missile F1-11 video on TV in February 1986. I was sold. I didn't see SSS live first time around but saw them in December 2000 when the lineup was Martin Degville, Tony James & Neal X. I was going to see that lineup again in September 2003 but the band split up just before their UK tour. Tony James & Neal X did the tour without Degville. It just wasn't the same. Martin Degville gigs and releases "internet only" records under the name Sigue Sigue Sputnik nowadays. The main reson for my recent trip to London was to see Degville live on stage again. He is on stage like no-one else. The night was like SSS song says: Success! Excellent pictures again, Tapio. Have always enjoyed listening to the first two SSS albums but lost track of them after that. Will do some looking over Christmas to see what has been going on since then. Only ever bought the first Sheep On Drugs album ("Greatest Hits" from memory) so must do some research on them as well. Glad you got to see Mr Almond as well. I was ill in bed the first time I heard Love Missile F1-11 & thought It did grow on me though. Have you ever heard Pop Will Eat Itself's version? The one & only time I saw SSS was in 1986. They were the first band to play a live gig in my hometown. A local band which included 2 lads I was at school with were the support. It was at the time of their Stock/Aitken/waterman phase & there were about 350 people at the gig. I really enjoyed it despite one of two local mindless morons trying to spoil it by trying to pick a fight, not with me but in general. The Things That Dreams Are Made Of. That's the best way describe last Sunday. The last official (surely not..?) Voxgate at 100 Club and then Ultravox at Hammersmith Apollo. Amazing! I agree! What an amazing day/night! Will never forget it! Thanks for all your pics Tapio!!! You're a star! Good to see you in the "thick of it" as ever, Tapio! And you've managed to get a background shot of me as well - bad luck. Apart from that, terrific pictures as ever. Mr Normall is the boy alright! Great viewing. The man has legendary status in Piggy's book. Thank you. BTW, I'm nowadays in Facehook as Tapio Normall. Now I know how it is like to stay a night in an expensive hotel. In the evening your favourite band play live downstairs. Next morning the singer/guitarist and the keyboardist/violinist of your favourite band have their breakfast 2 metres from you. I haven't got too many good pictures of the Stockholm gig. I'll put few better ones on the "Close Encounters..." gallery next week. So... the basic question now is... What did they have for breakfast? Are they more cereal-oriented, or do they rather opt for food with more substance such as omelette, sausages n tension-increasing stuff... or will they rather go for a healthy fruit & yogurt variante? Or what about some toast with jam or marmelade (marmite?? ) - no fat ( )...? Ahhh - aren't we all intrigued now...? Tapio, where's your report then??? I think its just really NICE that Midge and Billy can still sit down to breakfast together. I must confess that I didn't pay attention to the gig itself as good as I should have. After John Foxx's set with Louis Gordon I went to get something to drink (it was hot there) and after speaking with many people I ended up watching the rest of the gig much further away from the stage than where I originally was. Well.. it was fun. I put Close Encounters Of The Third Kind picture galleries online exactly four years ago. My quota on the server where the galleries were (and still partially are) run out this spring after the latest Ultravox pictures. I had to find a new server for the picture galleries and I thought why not to get myself a domain as well. Thanks for the Joker reference, westham pete. That means I must have done something right. Thanks for Jouni Törhönen, Scott Leang and Jus Kharis Forrest for additional pictures. Love the pics - I'm afraid for some reason I have not seen half of these! Great! Thanks! Hi westham pete! Yes I'm going to be there on December 3rd. It will be almost exactly six months after the Roundhouse gig. Great Mr. Normall, if i see you there, i will come up & say hello mate, i only got the £27.50p tickets for this gig / in the bacony, i will have my white Rage In Eden T.shirt on + my west ham cap on, theres a lot of us going from the (numanme/gary numan forum) by the way, you will always see me get about a lot on that forum aswell/ besides this vox one . These and new Heaven 17 pictures are the first ones taken with my new camera (Sony DSC-HX5V). Almost all the older pictures are taken with my old'n'faithfull Canon Ixus 40.